For decades, Kansas City, Missouri, has hired contractors to pick up trash in certain areas of the city, but now leaders are exploring a plan to bring those services in-house, a move that officials say would help control costs and improve service. KANSAS CITY, Mo. 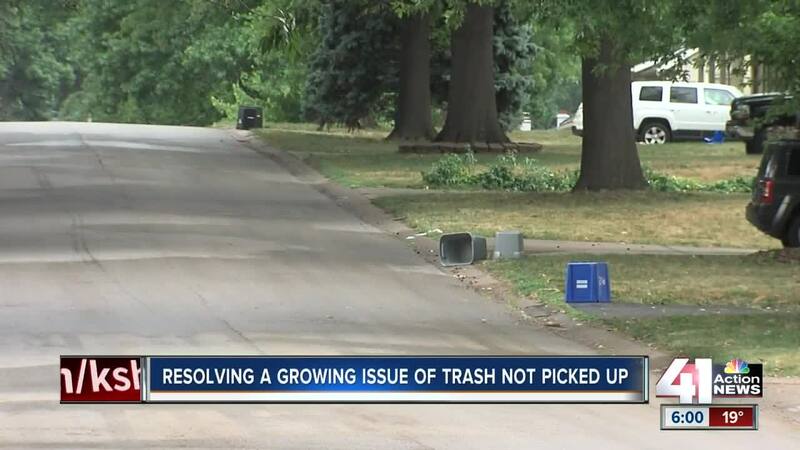 — For decades, Kansas City, Missouri, has hired contractors to pick up trash in certain areas of the city, but now leaders are exploring a plan to bring those services in-house, a move that officials say would help control costs and improve service. Complaints about trash pick-up in Kansas City's Northland are nothing new. Steve Diamond, who lives on Northeast 112th Street, said he always calls 311 to let the city know about the situation. "I've had times when it was up to nine days late before they finally came out to pick it up," Diamond said. He attended the City Council's finance committee meeting Wednesday to express his concerns to city leaders. "I always look at the 311 map and see how big of an area, and it's never just my street. It's a whole large area," Diamond said. Kansas City's Solid Waste Division recently did a deep dive into the dissatisfaction over trash service. The report found that 78 percent of complaints about trash or recycling collections are related to contract crews, according to Michael Shaw, manager of KCMO's Solid Waste Division. Several people provided testimony at Wednesday's meeting over the service issues. "And they (residents) have noticed bins being tossed, bins not being fully emptied," Markus Smith, a legislative assistant, said. With the city's contract for residential trash collection expiring next year, officials want to take back trash collection in all areas of the city. "The model that we've used for 40 years is probably coming to an end," City Manager Troy Schulte said. In the short term, there will be upfront costs to the plan: hiring 78 people, buying 23 trash trucks and building a new facility, possibly in the East Bottoms neighborhood, to store the equipment. But in the long term, officials say the plan would save the city nearly $20 million as it would also include collecting bulky items, doing leaf and brush pick-up and expanding neighborhood clean-ups. "Once this decision is made to go in-house, we're probably going to have a further eroding of service in those areas in the city because the contractor won't have a vested interest in picking it up for work that's going to go away, so it may get worse before it gets better," Schulte said. The ordinance related to the plan made it out of the finance committee Wednesday. The full City Council will vote on the plan Thursday. Schulte said he would like to have a plan in place by May 2020.